Chocolate lava cake is my favourite dessert. 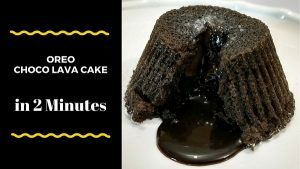 Today I am sharing a recipe for Choco Lava cake in a Mug that gets ready in just 2 minutes, so I named it as Instant Choco Lava Mug Cake. The delicious dessert requires the baking time of just 90 seconds in the microwave. 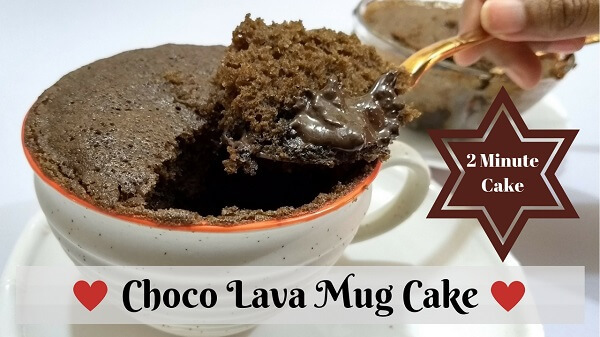 Follow the step-by-step recipe to prepare Eggless & Instant Choco Lava Mug Cake at home. Add all dry ingredients in a bowl; All Purpose Flour, Powder Sugar, Cocoa Powder, Baking Soda, Baking Powder and Salt. Stir & mix well all the ingredients. Now add liquid ingredients; Milk, Oil or Melted Butter and Vanilla Essence. Mix well and prepare the batter. Take a microwave safe Mug, add some Dark Chocolate cubes first. Pour the cake batter into the mug. Bake for 90 seconds in the microwave at high temperature. Instant Choco Lava Mug cake is ready to serve.